Raspberry Pi starter pack (Does not include Raspberry Pi) #piday #raspberrypi @Raspberry_Pi « Adafruit Industries – Makers, hackers, artists, designers and engineers! Raspberry Pi starter pack (Does not include Raspberry Pi) – You want to get hacking with your Pi fast, right? 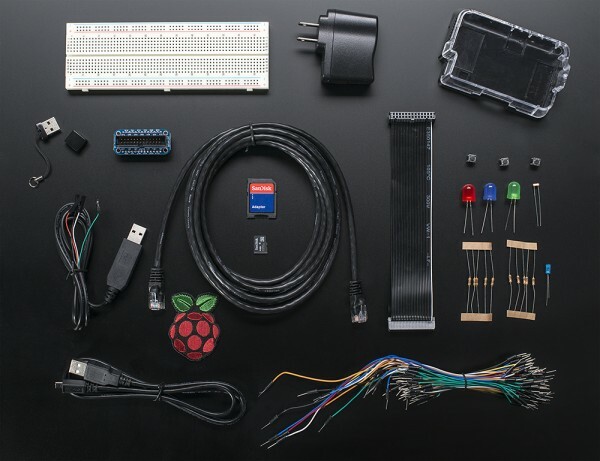 Get everything you need to start with the Adafruit Starter Pack for Raspberry Pi. It’s the perfect accompaniment to your new Pi, everything you need to get a distro image loaded and running. We pre-assemble the Cobbler for you, no soldering required. THIS PACK DOES NOT INCLUDE A RASPBERRY PI. To purchase a Starter Pack with an included Raspberry Pi Model B Revision 1.0, code 2, please click here. Over $82 in parts, now at a 15% discount – only $69.95 ! New! Adafruit Pi Case – Keeps your Pi snug and safe, and is compatible with the GPIO cable and cobbler! Durable and chic, snaps together in seconds. Adafruit Pi Cobbler kit with GPIO cable – with a little easy soldering this kit makes connecting to the GPIO/I2C/SPI/Power pins easy as pie. Designed for Model B Revision 1.0.